The reception that is afforded to any major foreign work when brought to Malta is always interesting to observe. Typically it elicits excitement among those who would not ordinarily pay too much attention. Which is always good as it helps expose them to different ideas and this, hopefully, will eventually translate to some form of curiosity over local art. It is equally interesting to see how hyped such events are which, judging by the ongoing exhibition of works by Pablo Picasso and Joan Miro, is a lot. Not only has this exhibition benefitted from the kind of advertising that local art shows can’t even begin to dream about but it has also been widely covered by every media outlet on the island. Hardly surprising, then, that so many people have made a point of visiting it regardless of their typical interest in art. Then again that of Picasso is one of the most bankable names in modern art and interest in his work was always going to be considerable. On show here are a number of Picasso’s etchings but they are not a disappointment. Far from it. Instead they showcase just what a talented artist he was. Despite their simplicity you are still overwhelmed by the sensuality that is invariably present in all the work. They transport you to the extent that, despite the mythical creatures that are the subject of many illustrations, you can feel the emotions of those being depicted. The essence of their lust, jealousy and love comes across in each one of these masterpieces. What is equally interesting is the growing influence of cubism that is evident in some of this work. It is not full blown but still pretty evident; the mark of an artist who is shaping his work in a new direction. Whilst it is possible to appreciate Picasso’s etchings for what they are, Joan Miro’s paintings are more of a challenge. Mirō was influential in the development of surrealism, an art form that saw artists present work that surprised and went against conventional perception. So it is with Miro’s work in this exhibition. Whilst the pieces bear titles like “Woman and Bird in the Night” there is nothing in the actual painting that would lead you to make the connection either to a woman or a bird. Naturally, it was never Miro’s intention to represent faithfully the title’s subject. His aim was to command the attention of his audience and evoke emotions with paintings that are bold and beautiful even though they completely challenged expectations. Those on show in Malta bear out this vision. The work is stunning in its beauty and in the interplay of colours, shadows and texture that Mirō used to bring his ideas to life. Each image is bolder than the previous one, taking the visitor on a journey unlike any other. It is largely thanks to this setting, with a number of images collected at the same place that one can truly appreciate his vision of colour and thoughts. 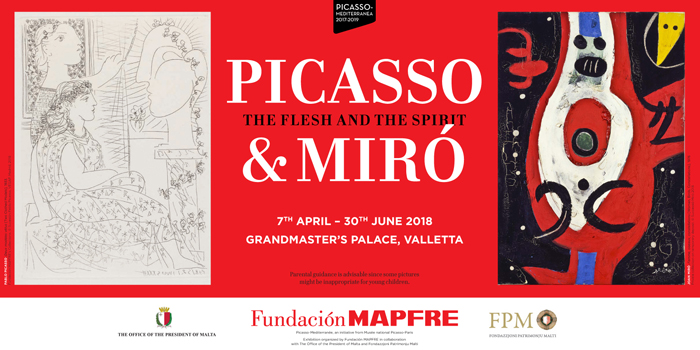 The Flesh and The Spirit is open till the 30th of June at the Grandmaster’s Palace in Valletta. The exhibition is organised by Fundación MAPFRE in collaboration with the Office of the President of Malta and Fondazzjoni Patrimonju Malti.